Lavshuca has updated it’s site with the brand new Holiday/Winter Collection for this year but don’t get too hyper as it’s nothing exciting that you’ll have to have! 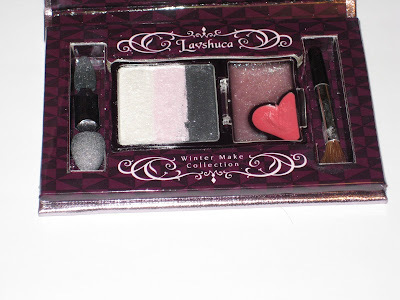 Last year I truly enjoyed the Lavshuca Winter Make Palettes released however this year nothing seems to be truly catching my eye but I will be indulging just so I can review the items for you here at Musings. Why Lavhusca has succumbed to some of thee most boring shades I’ve ever seen in my life lately is truly beyond me. Spring, Fall, and now Winter are a total devastating disappointment for me. Excuse the Muse while she jumps off the nearest bridge in woe! The Antique Collection consists of two color variations in a gift box for 1,890 yen each. Each gift box contains a lipgloss and a brand new duo eyeshadow in the style of the older single shadows from Lavshuca. It appears that Lavshuca has taken the initiative to start implementing much of it’s new style packaging in this collection so I think it’s safe to say you’ll see many of the older items become obsolete since they are fully embracing the new aubergine look and leaving behind the lacy white look from the past. It looks like you can create a brown or a black look with the collection. The first duo contains one black shade and one paler shimmering white or pink shade while the second has a lighter brown shade and either a pale shimmering pink or a cream white (just assuming colors from the pictures). Honestly, you can probably recreate the looks with these gift sets from any number of other items you have in your collection if you collect Lavshuca so it’s not something you absolutely have to run out to get unless you’re a serious fan and collector. The only thing that I find oddly appealing is the little draw gift boxes these come in! Go figure! I’m already thinking up items I can put in them as storage. Honestly, if you look close enough at last year’s Winter Make palettes from Lavshuca Holiday Collection 2007 you can probably create about the same look as this year! Also released with the Holiday Collection are brand new stick eyeshadows which you can use to line and shade eyes. Again, another ho-hum item for me and nothing I’m getting to excited about! Believe it or not I’d be more excited to see some sort of cream shadow released to replace the Lavshuca Jelly Eyes from a few years ago! Those were kinda fun and I regret not trying them out for myself at the time! 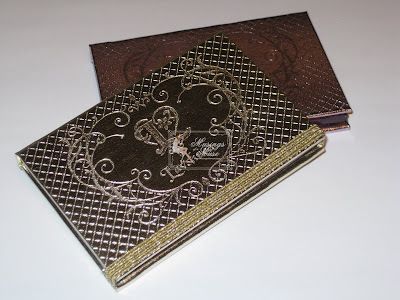 Although the collection fails to tempt me I will get the two gift sets to review here at Musings. I look forward to Spring 2009 and hope that Lavshuca can redeem it’s downward spiral it’s been on lately for the Muse! And oh, is Jillian Dempsey’s e/s good? I saw in Avon’s catalogue they are bringing in next month! Thank god I’m not the only one. What is going on with Lavshuca?!!?!? Intergrate doesn’t do it for me…Mostly it’s angelina joliee that scares me lol! Oh dear, the reviews were quite good, especially the latest palette! 😀 I shall wait for next month to get them! I’ll be announcing the winner in a post really shortly..I just got a bit busy. The names are in a large bowl at my desk 🙂 I’m about the pick who now! I’m great thanks, hope you’re well! no kid? I’m just not up for it honestly but will get them to review here..maybe I’ll like ’em but I’m not betting on it! I have a sorta orangy pink, a coral, a gold, a white, a beige, a blue, and a few other shades. I must say pigmentation is rather awesome 🙂 I was going to do a random review on the singles myself but decided meh I won’t bother but you’ve inspired me maybe I’ll do a review! I didn’t attempt trying them as blushes but good idea! I got them from a friend who lives in Korea, she cps for me. They are cheap as chips…$3 per a single..gotta love it! I paid $10 a piece…Boo!!! Hiss!!! Where did you order this? Is it from their official site? I have to say one advantage about Japanese cosmetics is that their design is SUPER cute/delicate. I have to give them kudo for that. However, that being said, I would not buy something that looks so delicious, yet looking closely colors are just so-so. 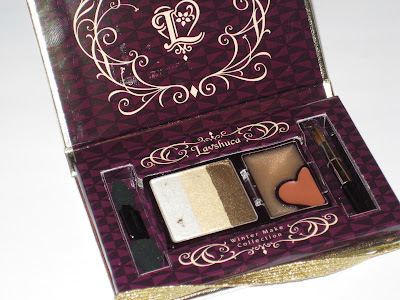 Is it me or does the eyeshadow duo design strikes as a similarity to Anna Sui’s eyeshadow duo? And what’s the total in US dollars? Thanks. they retail for $3 or $4 after converting! That’s crummy! I have a few friends in Japan and they get me items 🙂 You can’t order it from the official site. I do have a Japanese Purchasing Guide on my blog..that can help you find online sources to buy from but it’s quite costly sadly 🙁 and not retail! The new duos at around mmm $18 bucks…bit over with the conversion rate today. i saw ur reviews for last yr’s winter collection, and i was looking forward to sth as yummy this year. but it looks rather blah. It’s really blah….oh well…we can hope spring will be awesome!